JAMES CORNER, who will present and compare the work of JAMES CORNER FIELD OPERATIONS between 2002 and 2015. JAMES CORNER is the founder and director of JAMES CORNER FIELD OPERATIONS. James Corner leads the design of all projects from strategic planning and concept design through construction.He has devoted the past 25 years to advancing the field of landscape architecture and urbanism, through his teaching and academic work at the University of Pennsylvania and his leadership on high-visibility, complex urban projects at his practice based in New York City. 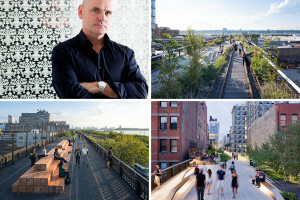 James Corner is a tenured professor of Landscape Architecture at the University of Pennsylvania, his work has been published and exhibited internationally, and he has been recognized with significant design awards. He is a registered landscape architect and is on the Board of the Forum for Urban Design. JAMES CORNER FIELD OPERATIONS is renowned for strong contemporary design across a variety of project types and scales, from large urban districts and complex post-industrial sites, to small well-crafted, detail design projects. In all of the work, there is a special commitment to the design of a vibrant and dynamic public realm, informed by the ecology of both people and nature. Major projects include the High Line in New York, Seattle’s Central Waterfront, City Center in Las Vegas, Tsim Sha Tsui Waterfront in Hong Kong, Chicago’s Navy Pier, Tongva Park and Ken Genser Square in Santa Monica, and South Park at Queen Elizabeth Olympic Park in London.